5 x 25mm Pozidriv Bits: PZ1, PZ2(3) & PZ3. 5 x 25mm Phillips Bits: PH1, PH2(3) & PH3. 2 x 25mm Slim Phillips Bits: PH2G(2). 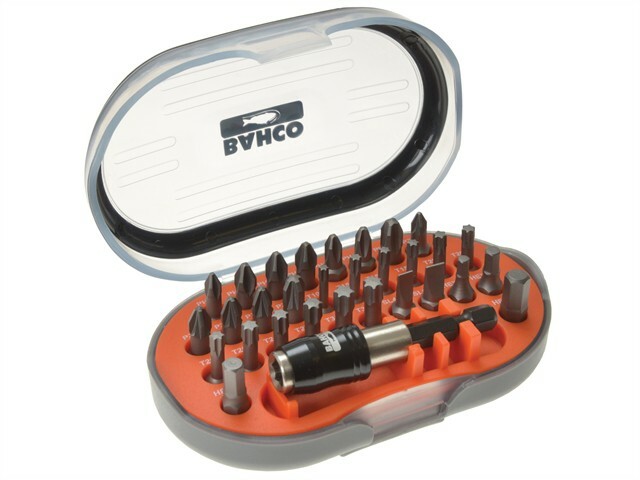 12 x 25mm Torx Bits: T10, T15(3), T20(3), T25(2), T27 & T30(2). 2 x 25mm Slotted Bits: 4.5 & 5.5mm. 4 x 25mm Hex Bits: 3, 4, 5 & 6mm. 1 x 25mm Magnetic Bit Holder. The quick release magnetic bit holder ensures that the bit remains securely in the holder until the release is driven. It features a groove part in both sides of the black coated body for a better grip and a lock-in type system with forward function.